The CSCTA is a partner with Swimming Canada for the development of the NCCP program and annually contributes funds for this purpose. For 2017-2018 the CSCTA Board of Directors confirmed a contribution of $25 000.00. The CSCTA contributed $11 000 to support the 2017 Regional Coaches Conferences. 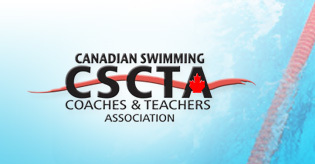 As per the Coaching Association of Canada’s (CAC) policy on the maintenance of certification, all registered coaches with Swimming Canada are required to maintain their “trained” and “certified” statuses by collecting Professional Development (PD) points. By attending a regional swim coaching conference or the national swim coaching conference, coaches can earn 3 PD points towards their maintenance of training and certification. As long as the coach’s name appears on the list of attendees for the respective conference, it will be the responsibility of the Provincial Section or CSCTA to forward this list to Swimming Canada to record the points in the Locker. For more information on how to collect PD points, please consult Swimming Canada's website or your respective Provincial Section. During the 2014 National Conference the CSCTA created what we hope will be the first in a series of educational and supporting videos for our Members. The Activation video is available to download at the following link. Please note that to view the entire length of the video you will need to download it to your computer or your own dropbox account. This video is filmed in real time so your athletes can follow along while they are learning the program. Thank you to Eugene Liang and Graham Olson for their expertise in producing this video.